Does your garden become a wall of green later in the summer? Add drama with colorful containers, garden art or painted garden furniture. Experiment and move your pieces during the season to highlight a spectacular plant, hide a bare spot, or create a focal point. Many garden accents can be left out year round for four-season interest. 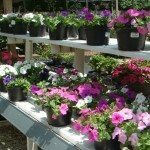 New shipments of annuals have arrived to provide long-lasting, vibrant color through the summer into fall. Try a hanging basket for a beautiful punch of color. Our signature party pots of annuals are available now for instant flowers. These large pots are $7.99 and are great for entertaining. Add them to containers, planters, or just pop them in a bed. Some of our favorite long-blooming summer perennials include roses, rudbeckia, calamintha, fumitory, echinacea, hydrangea, butterfly bush and more! Add bright, bold splashes of color with foliage plants like perennial hosta, heuchera, and variegated shrubs, plus annual coleus, caladium and sweet potato vine. Bright white or lime green foliage can light up a shady corner while deep purple leaves can calm a sunny spot. Cool blue needles of evergreens along a property line can create the impression of distance. Need more ideas? Explore the Learning Gardens at each location. They have been thoughtfully to showcase flowers in every season. Ask us! We’d love to help you dress up the garden this summer.